Perfectly trimmed bushes of stem plans are the dream of every planted tank keeper. In the following we'll explain how you can reach this goal with the right trimming technique. At first let us say that stem plants are quite easy to handle and to trim. 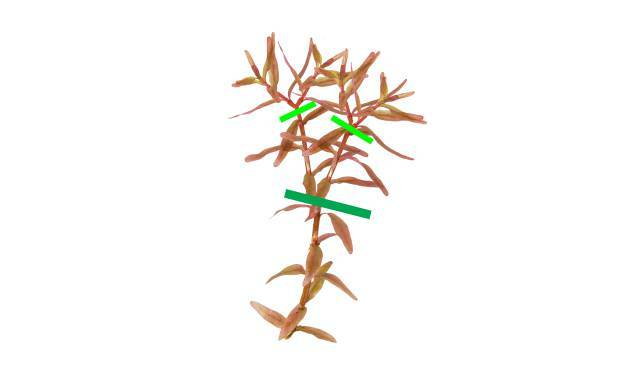 A new plant may develop from each short piece of stem. 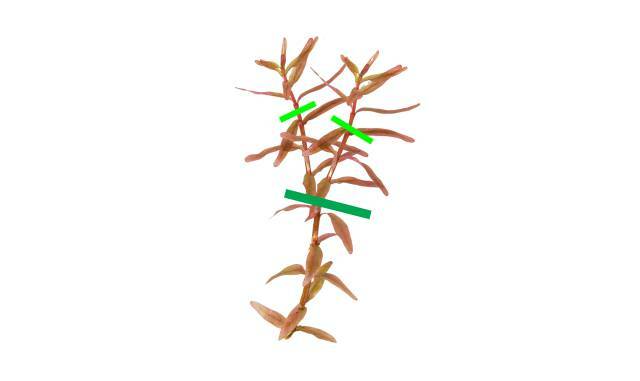 Therefore it is not a problem to cut this kind of aquarium plant radically back and leave only a few centimeters of leafless stem. Thanks to their high growth rate (given that they are provided with all the nutrients they need) stem plants will grow back — and with a vengeance — after a relatively short time. 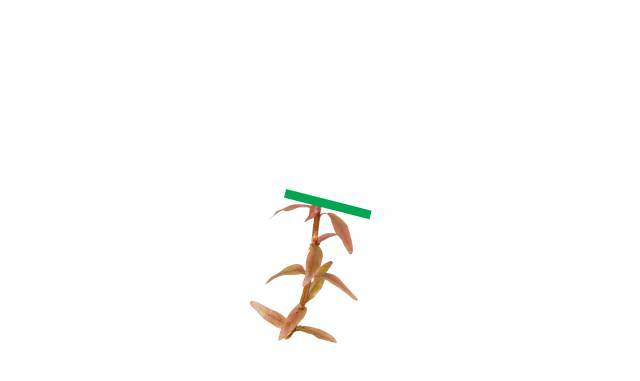 Basically, there are two different methods for cutting back aquatic plants. The classic approach mainly used in Dutch tanks is to cut off the more beautiful upper parts of the stems (the lower parts lose some or even all of their leaves over time, which is normal as the upper parts grow larger and shade the lower parts off). After cutting, the older parts are taken out of the tank and are thrown away, and the cuttings of the nicer upper parts are planted in their place. This is the preferred technique for creating the plant streets that are so typical for Dutch-style tanks, and there are a few plant species (like for example Eriocaulon cinereum) that can be cut back only in this way. The disadvantages of this method are that it is rather time-consuming, that the water may cloud as you stir up the substrate and that your different substrate layers will mix when you remove the lowermost parts of the stems and pull out the roots. 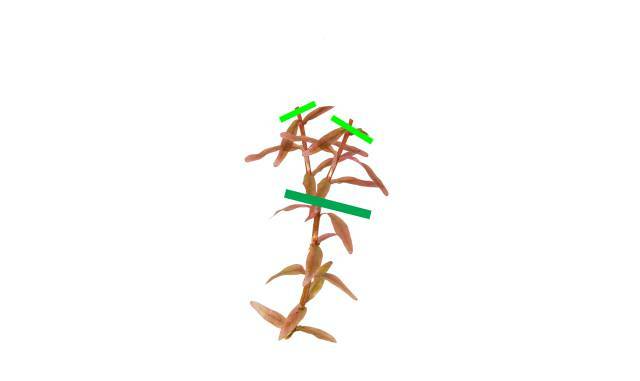 This technique will not allow you to give your stem plants the bush-like form so many people like in their aquatic plants. 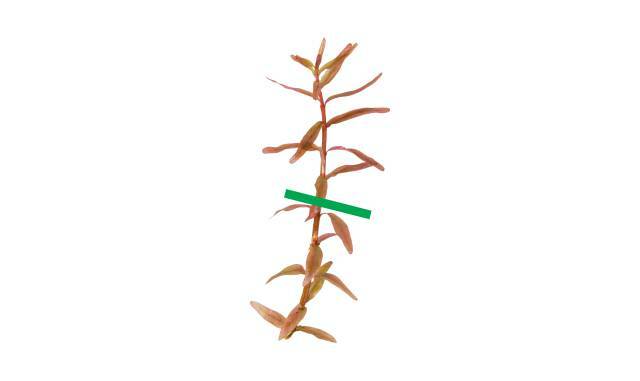 In aquascaping or in a Nature Aquarium you proceed vice versa, which means that you leave the lower, leafless parts of the stem plants exactly where they are and remove the cuttings (alternatively you can of course plant them in another area or use them to make your plant group denser). This method makes a well-structured midground in an aquarium layout with lots of decorative materials like rocks and driftwood, overgrown with slow-growing epiphytic plants or mosses, so important. These structures are needed to hide the unsightly leafless stems from sight. After some time, the background plants grow back and are again visible above the midground decoration. In order to achieve the desired bushy growth in your stem plants you need to apply the trimming method used in the Nature Aquarium. Cut back your stem plant (or entire group planting) down to about half its original size when it has grown out too long. In the following photo the recommended cutting line is marked dark green. Remove the upper part of the plant from the tank after cutting. Most stem plants tend to sprout two new top shoots (which are in fact lateral shoots) in the place the top shoot has been cut off. We make use of this fact. In our example, two shoots have grown from one stem, and after some weeks they have gained a certain length, growing nicely and strongly. Now the time has come for another round of trimming. Both shoots are cut back and the tips are removed (please refer to the light green cutting lines). As a rule, two new shoots will grow from each lateral shoot that has been trimmed, which results in four shoots from the original stem. Basically, you can do this almost infinitely to get more and more shoots. After some time, however, the overall height of the plant bush will become too large for your aquarium, and the plant will reach the water surface. Then the time has come for another radical cut-back. The plants need to be trimmed considerably. A great point for cutting would be shorty above the place where you trimmed the plant for the very first time (almost immediately above the dark green line). 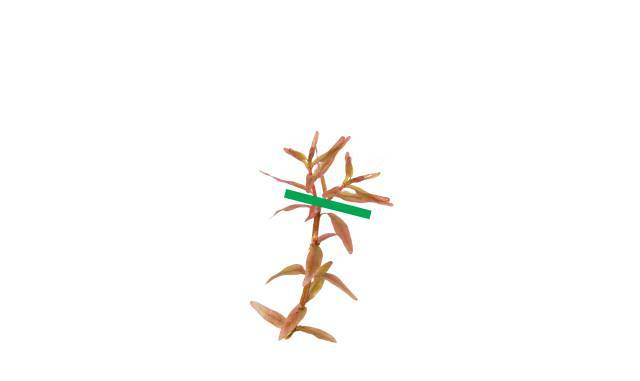 Thus you will be back to four new shoots when the plant starts growing again. Between the trimming sessions it is sufficient to just shorten individual shoots that have grown out faster and longer than the other ones. This will give your plant group a homogenous, harmonic appearance. To keep your aquatic plants fresh and vigorous, you can plant your cut-off top shoots among the existing groups of plants. Regular trimming increases the aging process of the plants, and after a few months they may develop a stunted growth habit. Planting some of the fresh shoots among your plant groups is a great remedy for this problem, and you will be able to enjoy your aquatic plants for a much longer period of time.